Grant Thornton released a new report finding that the United States ranks in bottom 10 performing countries for women in senior management roles, we were curious to know which countries ranked at the top. Another interesting finding from the report was that only 11 percent of businesses globally have a program to support and mentor women. Globally, 70 percent of businesses cite that they are not considering starting such programs, while 13 percent are considering mentor programs for executive women (!!). So disheartening when we know that mentors and sponsors make a significant difference in women’s career advancement. For more of data on where women stand globally, be sure to check out Grant Thornton’s well-done SlideShare (16 slides). 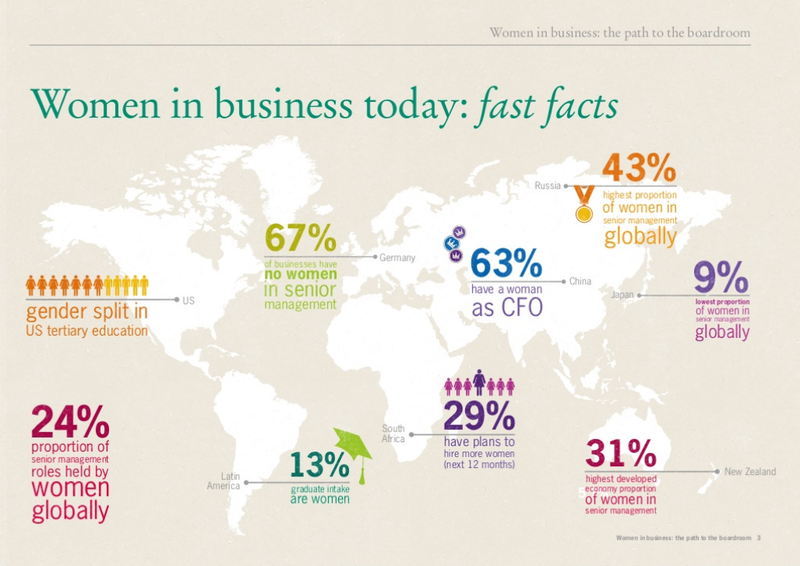 The below images were also pulled from Grant Thornton’s 2014 International Business Report (IBR), Women in business: from classroom to boardroom.